Manatees are somewhat migratory animals. In the summer months, they travel around Florida's rivers and coastal areas, and some may even venture outside the state. But in the winter, when the water temperatures cool, manatees start heading south to warm water refuge areas. All except for Nick, that is. He would be the manatee heading north. Affectionately called "Crazy Nick" by researchers, Nick the manatee is a rugged individualist. He is known for heading north when all the other manatees head south. One winter, Nick spent two weeks traveling north from Blue Spring State Park -- located near Daytona Beach -- to Jacksonville, Florida. Another time, when the majority of Blue Spring manatees went to Lake Beresford, Nick went to Mud Lake. The only time Nick went to Lake Beresford was when all the other manatees went to Mud Lake! We know this information about Nick because he has been "tagged," meaning that he wore a tracking device. At the time, this was a belt fitted around the base of his tail. The belt contained a powerful transmitter, and Nick was tracked by plane and boat. 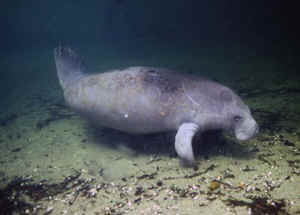 Today's tracking devices also consist of a belt that is attached around the base of the manatee's tail, but the belt is attached to a flexible tether and floating transmitter. Signals from the tag are transmitted to satellites that orbit the Earth and are sent to researchers' computers over the Internet. The information from the tracking device tells researchers about manatee behavior and habitat use, which can be used to help protect them. Once, while Nick was being tracked, he disappeared, and the researchers couldn't locate him. As a joke, they posted his photo on their refrigerator door with a sign that said, "WANTED: For tracking evasion." It turned out that Nick had found his very own private spring. A man living on Shell Creek had diverted an artesian flow for his own use. When he was not using it, he let it flow into the creek, which is where Nick discovered it. Underwater video footage of Nick that was taken in December 2012. The camera captures the unique scars that researchers use to identify him, including the bell-shaped hole in his tail. Many of Nick's scars are from boat hits. Manatees are known as semi-social, somewhat solitary animals. Because they have evolved with few natural enemies, they have not needed the protection or cooperation of a herd. They sometimes gather in small, informal groups, but they have no leader or real herd structure. Manatee gatherings, or aggregations, are largely due to common habitat requirements such as warm water, fresh water, or food sources. First identified in 1977, Nick has taken advantage of the warm spring waters at Blue Spring State Park for many winters. He no longer wears a tracking device, but he can still be identified by researchers because of the unique pattern of scars from boat strikes that he has on his back as well as the bell-shaped hole in his tail. When he is not striking out on his own adventures, Nick usually makes a number of appearances at Blue Spring each winter, and he seems to be fairly social. He is often seen with fellow adoptees Doc, Brutus, Howie, Paddy Doyle, Deep Dent, and Philip. Nick has also been known to pay attention to a number of the ladies who frequent the spring, including Phyllis, Georgia, and Julie. In the last few years, Nick has been what Wayne Hartley, Save the Manatee Club's Manatee Specialist, calls a "Tail-End Charlie." While many manatees may start arriving at Blue Spring in late October or early November, Nick usually shows up in December, and he may be among the first of the manatees leaving for the season when the weather starts to warm up. This was true last year, as Manatee Season began on October 29th, but Nick didn't bother showing up until November 23rd (just in time for Thanksgiving!). However, he made a respectable 19 visits to the park and departed on March 29th with Squeaky, Doc, Howie, Phyllis, Rocket, and Whiskers.